Beacons – like them or hate them, you can’t ignore them! With brands like Macy’s and the likes deploying them on a large scale, beacons can no longer be ignored. While there has been a surfeit of buzz around iBeacon technology, a lot of brands still prefer to take a “wait and watch” approach and are taking tiny steps towards adopting this technology. Though, most brands are using beacons to send targeted ads to customers, beacons are actually capable of much more than that. These tiny devices have the potential to deliver rich digital context on top of the real world and it goes much beyond collecting big data and advertising aggressively. In this post, we discuss how five brands across verticals are using beacons effectively and hitting the right chords for customer engagement. Nivea’s famous magazine ad campaign called the “Ad Shield” was a print ad that could be ripped out of a magazine and be used as a child-tracking wristband that warned parents if their kids strayed too far away. The magazine ad, made with special moisture-resistant paper and a built-in locator device, needed to be synchronized with the Nivea Sun Protege application. A parent could thus program the distance they chose, and when their child exceeded the distance limit, the application issued an alert right to the parent’s smartphone. The brand won the Mobile Grand Prix award for this campaign and is (arguably) one of the best beacon implementations till date. The brand thus showed their customers that they ‘care’ by putting beacons to good use and we like it! Famous drugstore chain Duane Reade recently upgraded its iPhone app to include support for beacons in 240 of its New York stores in a bid to foster customer engagement. iv) A floor map that displays a bird’s eye view of the store and also a product locator that plots the location of an item on an in-store map. With this Duane Reade has managed to make the most of what marketers can do with beacons: sending targeted ads, providing ‘in-store’ navigation, leveraging loyalty programs etc. While most of the use cases and current trials around beacons focus on interacting with consumers by sending a push message as they come into proximity of a beacon, there are brands that are thinking beyond “in-store” offers. Levi’s recently deployed beacon-enabled billboards prompting customers with an offer and driving them into nearby stores. It was an attempt by the brand to see if customers who visit brick and mortar stores actually saw the billboard posters, or that they visited the store, but then actually purchased the product through the website. Virgin Atlantic, recognised as an innovator in the airline industry began trialling iBeacon in the Upper Class Wing at London’s Heathrow Airport in May 2014. Premium passengers of the airline received personalized notifications and offers via their iPhones. In the initial stages of the trial, customers were alerted to have their electronic boarding passes ready when they were close to a private security check, also passengers in the departures section of the airport were sent tailored offers like commission-free currency exchange deals. Virgin also used iBeacon technology to let passengers know about in-flight entertainment specials before they boarded the plane, and to let their staff know when temperatures dropped on outdoor decks (the beacons have in-built temperature sensors) of their airport lounges so they could give blankets to passengers. 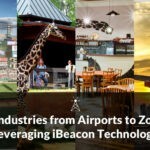 This is a great example of how the experience of air travel can be truly enhanced and personalized using beacons. Beacons and Wi-fi triangulation together create the first indoor positioning system installed in such a large space – at the Levi’s stadium in California, a stadium that is 1.85 million square feet and houses 68,000 seats. The deployment enables a host of location-based services for stadium goers like: quickly and accurately finding concessions, restrooms, and seats with the Levi’s Stadium app, no matter how deep into the stadium they are.The accuracy of offers and ‘help’ (navigation) is something the brand claims is extremely precise. There is no doubt that beacons offer businesses unlimited opportunities to ‘surprise and ‘delight’ customers. For these opportunities to be successful, it is critical for brands to treat the value exchange with their customers with respect by creating quality communications, content and interactions using beacons.